CAL>Isuzu employs 76 staff; some required to do specialist work to keep the big rigs on the road. Workplace English skills are an important part of the role. Umesh Nand is a diesel mechanic who’s been in New Zealand for 11 years, and with CAL ISUZU for five. Recently, he’s been working with an English Language Partners’ teacher to improve his written and workplace English. What’s more, he has his lessons ‘on the company’ in company time. 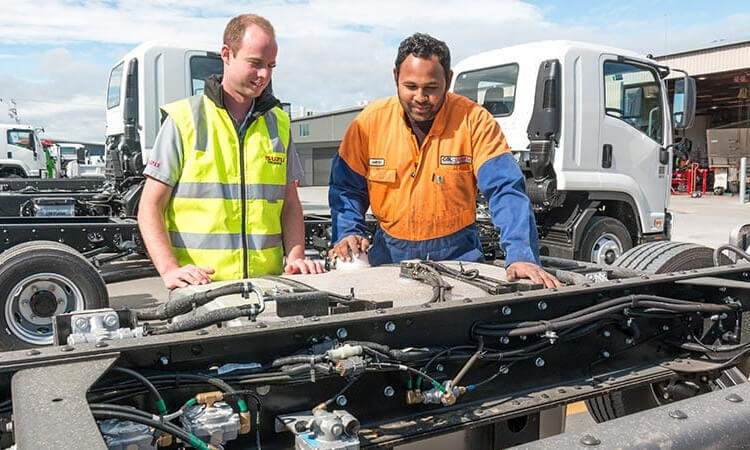 Umesh is Fijian Indian and his first language is Hindi, and while his spoken English is pretty good, his boss, Mechanical Service Manager Alex Boles, thought his written language could do with some fine tuning. “Every truck we service has a job-story and we need to understand that story correctly,” says Alex. Alex had worked with English Language Partners when two Sri Lankan mechanics needed to improve their English, but they studied off site at night classes. Because Umesh lives in Huntly, Alex says it made sense for him to learn at work. Umesh’s major issue was tenses; past, present and future. In his job-stories, Umesh must state what needs doing, what he’s done and what remains to be done. Get the tenses wrong and there can be confusion and at worst, a vehicle could go out on the road without the necessary work being completed. Jo says Umesh is now a lot more confident about speaking up in the workshop if he doesn’t understand. He’s extending his vocabulary and is also better at making himself understood. Umesh admits he was initially nervous about taking lessons. Alex says diesel mechanics are hard to come by in New Zealand with about 90% recruited off shore. That can be a long and complicated exercise, so it makes sense that once you have employed someone you do your best to retain them. Meanwhile, Jo says she takes her hat off to CAL ISUZU for their forward thinking.